Arcadia lost one of it's oldest residents and a true American hero Wednesday, August 2, 2017 as Hershal "Bud" Eugene Moore passed away at I.U. Saxony Hospital at Fishers, IN. He was born near Sheridan, IN to Hershel and Katherine (Crooks) Moore on July 21, 1920. Moving with his family to the Arcadia area he attended the local schools and graduated from Arcadia High School with the Class of 1939. Being the oldest son in his family, he was soon drafted into the U.S. Army. His father accompanied him to his place of departure, gave him words of encouragement and wisdom, and told his 18 year old son he would be awaiting his return. His father died before his return. 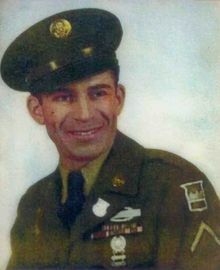 His active duty service began July 21, 1942 where he soon saw fierce combat at France and Germany. In a foxhole, a hand grenade landed and exploded near the men and shrapnel wounded both of Bud's knees and blinded his buddy. Knowing the peril they were in if they stayed in the foxhole, his buddy yelled, "Bud if you will be my eyes, I will help you run". And they tried to escape, but were captured and sent to Stalag II, a prisoner of war compound. They later ended up in the prison hospital. They were in captivity for 13 months as prisoners. They were ill fed and ill cared for. An elderly German man would visit the men and sneak in bread under his clothes. And he helped them escape. In their escape, they boarded a train that ran by the POW camp that took them away from their compound. They were told to leave the train before it got to a certain point as explosives would soon destroy it. They witnessed the explosion. In unknown territory, they wandered for some days until they were found by American G.I.s and rescued. Bud served as PFC 80th Inf. Division-Blue Ridge Mt. Division, 318th Infantry Regiment, Company E, 2nd Battalion-1941-1945, 3rd Army under General George Patton. Among several awards, he was also awarded two Purple Hearts. He was honorably discharged December 3, 1945. and returned to civilian life. Being a hard worker, Bud worked at Firestone Rubber Products Company at Noblesville, IN for 22 years, building and molding tank tracks. For over 40 years, he also was an independent milk hauler, picking up large metal cans of milk at various farms and delivering them to the processors. He married Martha Frances (Regan) Moore who preceded him in death April 17, 1986. In addition to his wife, he was also preceded in death by his parents, a son: Terry Lee Moore and several siblings. Surviving him is a daughter: Sandy Tolley of Arcadia, IN, a son: Jon Fredrick Moore of Seffner, FL, and grandchildren: Eddie Gene Moore, Kane Hutchison, Nick Hutchison and Robert Michael Moore. Funeral services will be held Tuesday, August 8, 2017 at 2:00 P.M. at Hartley Funeral Homes Cicero Chapel, 209 West Jackson Street, Cicero, IN 46034, with Pastor Jody Brown officiating. Burial will follow at Arcadia Cemetery. Visitation will be from 5:00 to 7:00 P.M. Monday also at the Funeral Home. Graveside Military Rites will be provided by the Cicero American Legion where Bud was a lifetime member. Memorial contributions may be made to the Cicero American Legion through the Funeral Home. You may send condolences at www.hartleyfuneralhomes.com. Add Photos, Videos, Music that tell the story of Hershal "Bud"'s life.